Katie Derham hosts Proms Extra, the Proms magazine show. Katie is joined by Sascha Goetzel, Clare Teal and Mark-Anthony Turnage as the focus turns to the Battle of the Bands. This time the spotlight is on the Battle of the Bands and the swing era of the 1930 and 1940s plus Sibelius and Vaughan Williams. 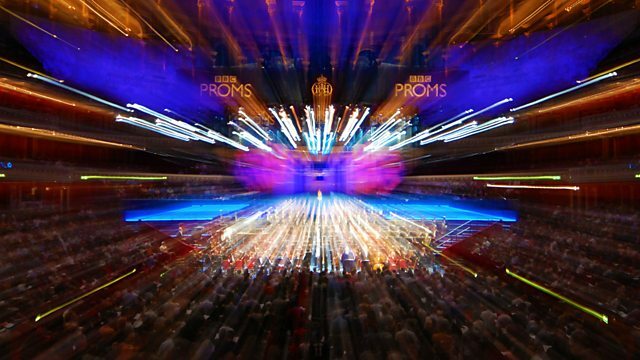 Katie is joined by jazz singer and host of the Battle of the Bands prom, Clare Teal, conductor of the Borusan Istanbul Philharmonic Orchestra, Sascha Goetzel and British composer Mark-Anthony Turnage, plus David Owen Norris presents 'Chord of the Week'. Brilliant new works including Jonathan Dove’s Gaia Theory. Conductor: Nicholas Collon. Orchestra: Aurora Orchestra. Performer: Chantage. Conductor: Andrew Manze. Orchestra: BBC Scottish Symphony Orchestra. Conductor: Sir Andrew Davis. Orchestra: Melbourne Symphony Orchestra. Performer: Truls Mørk. Conductor: Jules Buckley. Orchestra: Metropole Orkest. Performer: Laura Mvula. Composer: Duke Ellington. Composer: Paul Francis Webster. Conductor: Grant Windsor. Orchestra: Duke Windsor Proms Band. Performer: Gregory Porter. Conductor: James Pearson. Orchestra: Count Pearson Proms Band. Performer: Vula Malinga. Conductor: Josep Pons. Orchestra: BBC Symphony Orchestra. Performer: Ingrid Fliter. Conductor: Andrew Manze. Orchestra: BBC Scottish Symphony Orchestra. Performer: Roderick Williams. Composer: Ted Koehler. Performer: Clare Teal. Performer: Grant Windsor. Performer: Simon Little.